PART 1 OF THE RADIO GNOME INVISIBLE TRILOGY WITH 2015 REMASTER ON SPECIAL EDITION "INVISIBLE" VINYL IN A GATEFOLD SLEEVE! Gong's quintessential trilogy comprised of the albums 'Flying Teapot', 'Angels Egg' and 'You' are reissued worldwide by BYG / Charly Records, remastered in 2015 from the original tapes by Nick Robbins at Soundmastering Studios. 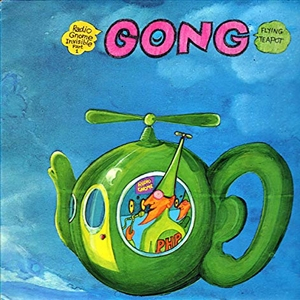 'Flying Teapot' is an avant-garde collection of sound effects, jazzy improvisation and comic vocals, all displaying the group's sense of humour and wacky approach to their music. "The Pot Head Pixies" and "The Witch's Spell" are perfect examples of their unique musical style. It was also the first album to feature the psychedelic music innovator Steve Hillage, who would go on to become a full band member for the following two albums from the Radio Gnome Invisible Trilogy. This classic Gong trilogy is released on 180g heavyweight audiophile "invisible" vinyl featuring remastered audio in gatefold packaging and 16-page booklets. The current line-up, which features Kavus Torabi (Knifeworld) following the passing of founder Daevid Allen, is enjoying the success and worldwide tour of 2016 album Rejoice! I'm Dead! and have revealed the first of their 2019 festival appearances at the UK's HRH Prog.